Despite it's name, WonderCon allows fans to appear at the show, cosplaying as more than just Wonder Woman, Cassie, Donna Troy, Simon Williams or Artemis. Open to cosplayers of all titles and belief structures, here are some of the best spotted at this year's event. Behold! Ant-Man, Scarlet Witch and Quicksilver - see what being cast in a Marvel Movie does for your cosplay stocks? 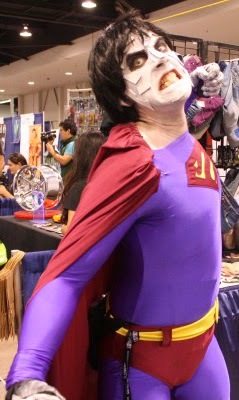 While Lobo is a pretty popular choice for your average KISS fan, Bizarro is just flat out awesome. While below, Tick brings back hilarious Saturday morning memories, does anyone else remember the days where Wolverine wore a shirt? Nope, me neither. Still Silver Surfer shows up to prove he ab crunches while waiting for Galactus to get hungry, and suddenly the 'Con looks like an ad for the latest Chuck Norris home gym system. P.S. It was also announced at the WonderCon that IDW are giving John Buscema's Silver Surfer an Artists Edition, so keep your star-spanning eyes open for that one! Dr Strange advises you to keep your eyes off his Eye of Agamotto, while a fairly Bruce Timm inspired Batman Baddies bunch strike a pose. And just incase you thought there was a typo in the header of this post, it's Bebop! He may not be in the new movie, but the snout-faced foe of the turtles always looks like one mean dude to me! SPOOOOOOOOOOOOON! Always nice to see The Tick and Arthur. That Bebop is AWESOME! -Absolutely wins. Thanks King - I'm glad. For a moment I thought I might be the only guy round who still remembered Tick and Arthur. Thanks for the comments! Thanks Frank - that is one mean hook you have there! Any other characters you specialise in?